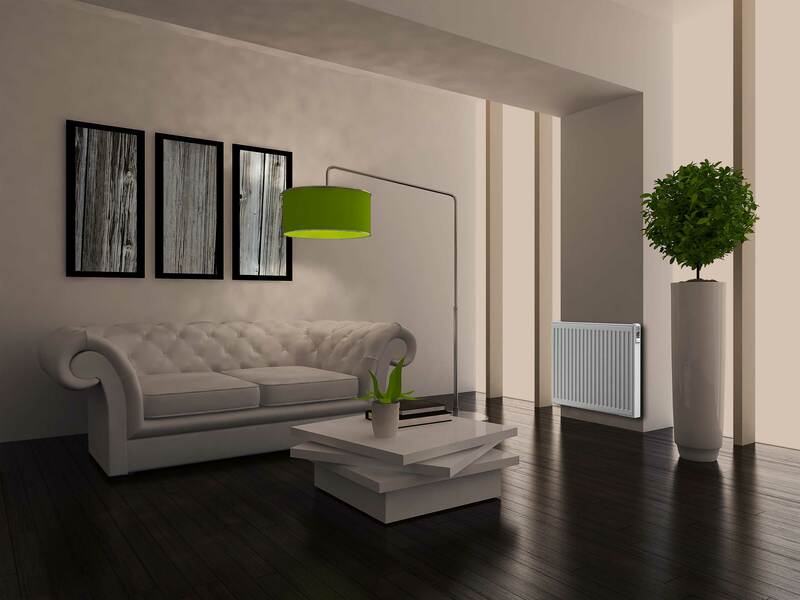 The compact design with clean lines ensures that the radiator will blend with any interior. The overall impression is enhanced by the modern design of the electronics and touch screen. Thanks to the robust design and construction with excellent heat storage capacity, an even heat transfer is guaranteed throughout the room, reducing temperature drops during short-term power loss (HDO). The radiators feature enhanced user comfort and economic operation. The touch screen control is simple and intuitive. All radiators meet strict European safety standards. The possibility to limit surface temperature minimises air disturbance and burning dust, making the radiators suitable for heating by those with allergies. Radiators are equipped with intelligent control built around the PID algorithm. This ensures perfect thermal comfort and minimal power consumption. 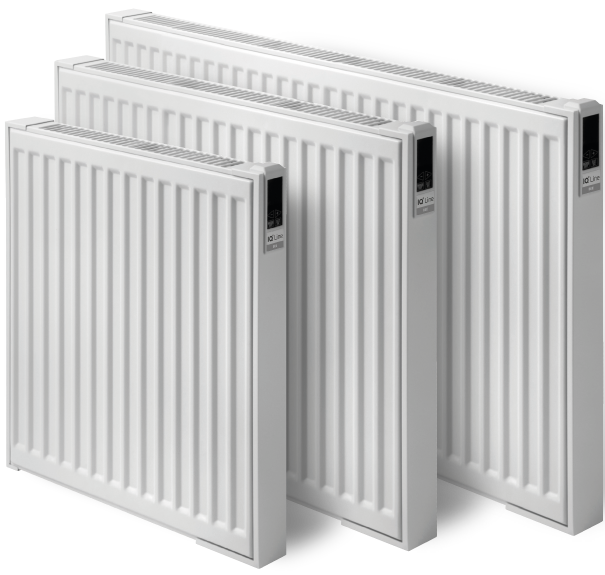 The electric radiators are developed and manufactured in Slovakia. Under the influx of cheap Asian products, the MADE IN THE EU mark acts as a guarantee to customers that they get the quality they pay for. 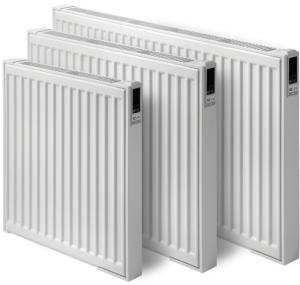 IQ Line Touch combines unique design and advanced technology in a robust steel electric radiator with excellent thermal properties. Thanks to its smart regulation with manual programmable heating mode, and reliable and economic operation, it is ideal for the electric heating of apartments, houses, holiday homes, small hotels, and offices. After setting of the desired temperature using the = + (plus) and – (minus) buttons, the radiator will heat the room as required. It is not economically viable to heat all rooms, including those not regularly occupied, to a comfortable temperature. The weekly program allows for the setting of temperatures according to day and time of day, and definition of temperature drops. Optimised setting of the weekly program can save up to 35 % on energy costs. For holidays that require heating outside of the settings of the weekly program, it is possible to use the weekend program. 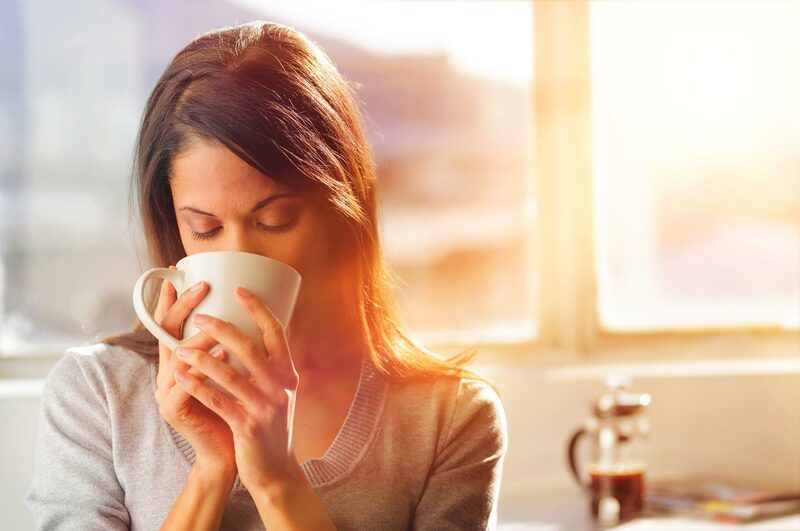 By simply activating the preset program, rooms will be heated to a comfortable temperature during the day and the heating return to saving mode during the night. 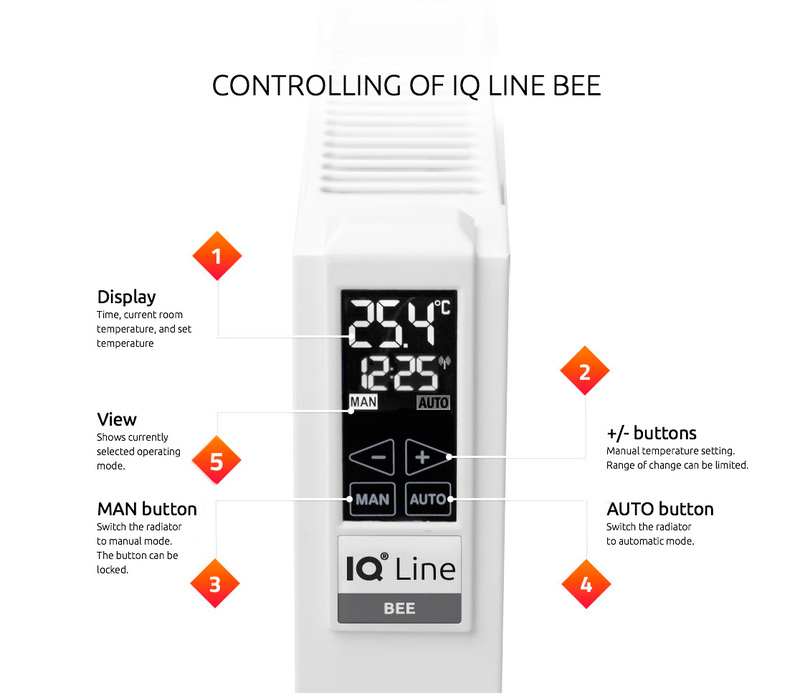 IQ Line Bee combines unique design and advanced technology in a robust steel electric radiator. It has excellent storage capabilities and features reliable and economic operation. Thanks to wireless central control via remote management over the internet, it is ideal for the electric heating of larger houses and holiday homes, hotels, schools, offices, and more. It is possible to control more than 600 IQ Line Bee radiators from a single central control unit. Thanks to two-way wireless communication, system administrators can not only adjust heating settings, but also obtain information about individual room temperatures or other important heating parameters. The heating mode of each room can be set individually. This allows for adjustment of heating schedules to the current use and occupancy of each room, and so can considerably reduce energy consumption and heating costs. 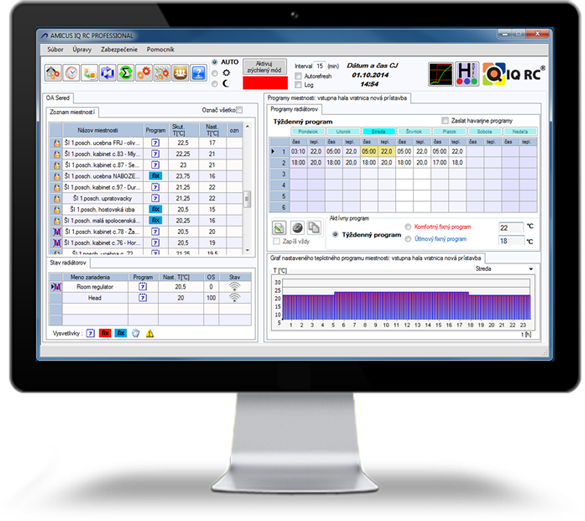 Adjustment of heating modes for individual rooms and other heating parameters can be implemented through the IQRC software application. For hotels, there is the additional advantage that the heating of each room can be linked to the hotel’s booking system. 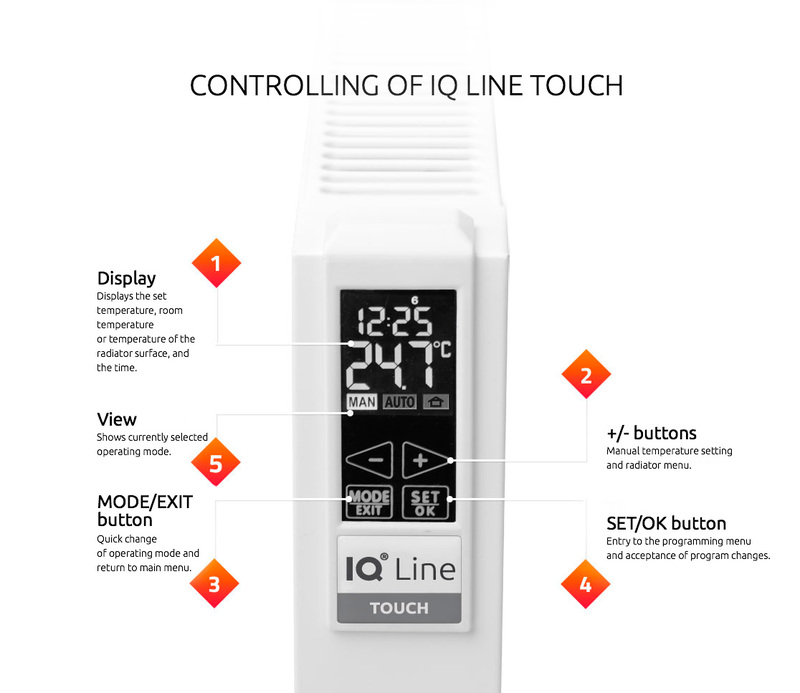 Wirelessly controlled electric radiator IQ Line Bee can be integrated into the IQ RC system, which was designed specifically for heating regulation and building automation. This makes it possible to use a single control unit and software application to control both electric radiators and hot water heating units, especially electronic thermostats. Thanks to the use of wireless communication, IQ RC systems are simple, time-saving, and affordable. Installation does not require structural modification and can be implemented in addition to normal operation. And of course, it is possible to remotely control the system via the internet. IQ RC has the potential to save considerable amounts on heating costs. The possibility of central control of the heating and an overview of settings and current room temperatures are the most effective tools by which to optimise operation costs. Zoned regulation of building heating allows for independent setting of heating schedules for individual rooms. No other type of control can deliver such effective and even heating throughout the various parts of a building. 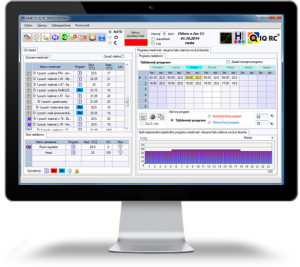 IQ RC enables wireless monitoring of temperatures in all areas where IQ RC devices are used. This is an invaluable feature for building owners and managers as it provides current information about heating management. IQRS was awarded “Best exhibit” at the international Aquatherm exhibition in Nitra. Our own innovation and development centre. Leaders in the implementation of wireless technology in the field of electric radiators. Following in the tradition of “Made in Czechoslovakia”. Multi-stage quality control as a priority.